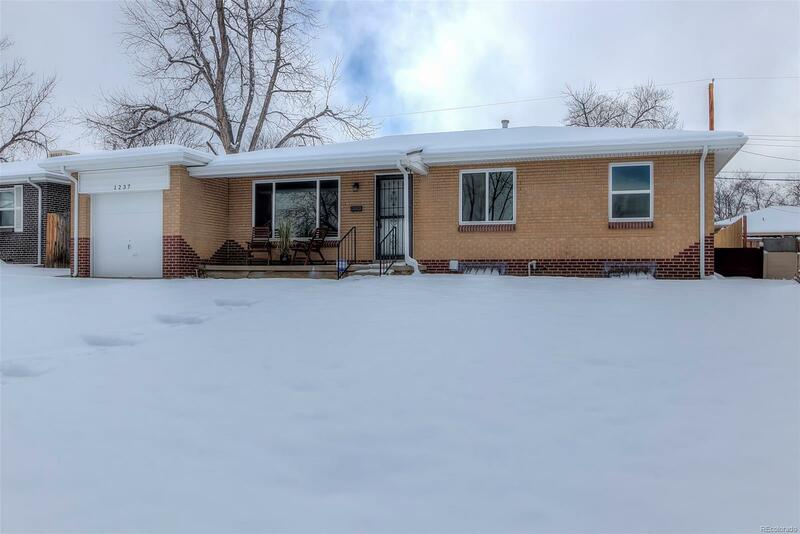 MLS#: 9675298 - Courtesy of Worth Clark, Inc.
Donât miss this stunning, remodeled ranch w/ finished basement & Jeffco schools! Refinished oak hardwood floors throughout main level & new carpet in basement. New quartz countertops, new stainless steel appliances, new custom tile work, new lighting, newly painted inside & out. Light & bright living room opens to convenient dining area w/ access to covered patio & large backyard. Gorgeous kitchen features quartz countertops, custom backsplash & floor, and garage entry. Beautifully remodeled full bath, master suite w/ half bath, and 2 additional bedrooms complete the main floor. Finished basement offers a spacious rec room, 3/4 bath w/ custom tile shower, 2 more bedrooms, & large laundry room. 1 basement bedroom has new egress window; bedroom #5 is non-conforming. Laundry room includes utility sink & plenty of storage. Newer roof, newer double-pane windows. Sprinkler system, A/C. All the hard work is doneâthis house is ready for you to call home!